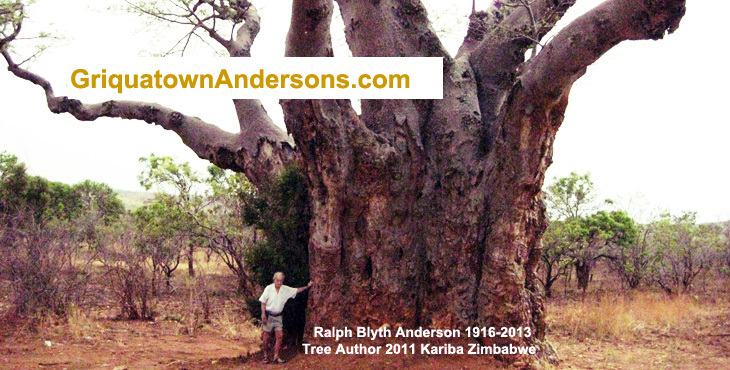 GriquatownAndersons.com is the family tree for 4871 individuals linked to Anderson of Griquatown [William Anderson 1769-1852] and the Anderson-Davel family. Anderson landed at the Cape, South Africa in 1800 and the following year founded Griquatown - an isolated place far north (beyond the Cape border) that became the main route for explorers, and also the centre of British Colony "Griqualand West" 1873-1880 with its own flag, coins, stamps and the Kimberly diamonds. William Anderson came from England but his ancestors traced to Thomas Anderson (1635-1699) Aberdeen Scotland. 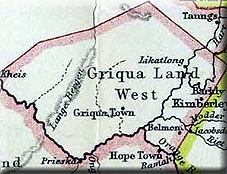 Anderson of Griquatown married Johanna Maria Schonken (1777-1848) whose direct ancestors landed in 1723 from Holland. Johann Christiaan Davel (1788-1842) of the Anderson-Davel's of Zimbabwe landed in South Africa in 1734 from Germany. On the maternal side of this family, John Balfour Blyth (Abt 1807-1891) landed in 1856 from Scotland and Johannes Pretorius (1642-1694) before 1680 from Holland. 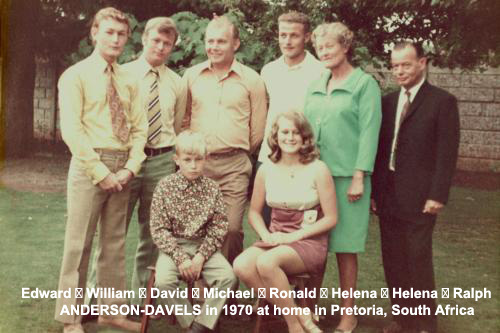 The Anderson-Davel family is one of the earliest arrivals from Europe in Southern Africa - arriving only a few decades after the first 197 people landed April 6, 1652 led by Jan van Riebeeck from Holland and long before the 3,800 British "1820 settlers" or explorer David Livingston who arrived 1841. In 1845 Livingston married Mary Moffat who was born at the Griquatown Anderson Mission. William Anderson landed when the white population in the Cape numbered less than 15,000. The parents of our Anderson-Davel family [photo on left] arrived in Zimbabwe [Rhodesia] probably after 1897 [when the railway from Cape Town reached Bulawayo]: William Wardlaw Anderson (1888-1978) likely 1914 and Willem Marthinus Davel (1886-1922) before then, entered Rhodesia and settled near Bulawayo and Gwelo respectively. Ralph Anderson dedicated a huge amount of time over the last fifteen meticulously researching and developing the information on this site. Nothing appears which he has not been quite thoroughly checked or confirmed. The sources include copies of original documents, old family Bibles, and records of various institutions such as the London Missionary Society and Aberdeen & N E Scotland Family History Society, both of which he personally visited a number of times. He also made a special visit to the site of Anderson of Griquatown's Mission in the Cape. We are extremely grateful for the work he has done and for the family history that is now available to our family spread across the globe. Information published on GriquatownAndersons.com is done so in good faith believing that it is acceptable to family members and friends. If there is any discomfort about any statement made, please contact us and we will expunge any such offending words. GriquatownAndersons prefers to remain free to include data of public record such as birth, death, marriage and divorce but for living people this data, and indeed most information, is password protected in the Family Vault. Access to our Anderson-Davel Family Vault: The ancestry for our family departed is available to all visitors to this site but information on the lives of our family living is restricted. However, if you are related to the family you can access our Family Vault (see menu left) to learn more about your living relatives as well as their ancestry: Please contact us if you would like a password for the Family Vault and can prove that you are a relative. Copy of original GEDCOM or Legacy File: The original data file is available to individual close family who are directly related to the Anderson-Davel line. 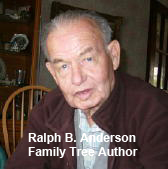 Indeed, we encourage family tree enthusiasts to continue and hold for safekeeping the outstanding work of Ralph Blyth Anderson. Concepts for Griquatown Andersons: Rev William Anderson, South Africa Missionary, London Missionary Society, Klaarwater Mission, South African History, Rhodesia History, Rhodesia Missionary, Rhodesia Family Tree, Rhodesia ancestry, Rhodesia descendants, Zimbabwe History, Zimbabwe Missionary, Zimbabwe Family Tree, Zimbabwe ancestry, Zimbabwe descendants, South African History, South African Missionary, South African Family Tree, South African ancestry, South African descendants, trace family history, find relatives, my family heritage, lost relative, where do they live, family relations, family lineage, family descendent, family pedigree, personal family, ex patriot family, immigrant families, Harare Family, Salisbury Family, Blyth Family History, De Jager Family History, Du Plessis Family History, Edmeades Family History, Forsyth Family History, Helm Family History, Jackson Family History, Melville Family History, Pretorius Family History, Weeber Family History.